The current eruption of Kīlauea Volcano on the island of Hawai'i has been closely monitored and studied since its inception in 1983. This laboratory exercise utilizes the excitement of an ongoing eruption to demonstrate magmatic processes (crystal fractionation and magma mixing) in an active shield volcano and to better understand features of a hotspot volcano. Pre-lab material on the Hawaiian hotspot and the Pu'u 'Ō'ō eruption includes maps, diagrams, photographs, video footage, and a pre-lab reading with homework questions. The lab activity involves examination of hand samples (available on request) and photomicrographs of lavas from distinct intervals of the Pu'u 'Ō'ō eruption, working in groups assigned to particular intervals of the eruption to make time-series analyses of lava geochemistry, and synthesis of the background information, petrography, and geochemistry to evaluate crustal processes of magmatic evolution followed by presentation of results to other groups. This lab is designed for an undergraduate course in petrology, although it could be used for a geochemistry or volcanology course at the undergraduate or graduate level. Thin-section petrography and interpreting geochemical variation diagrams. Familiarity with crustal magmatic processes. Background lecture on hotspot processes would be useful. Experience plotting data in Microsoft Excel is essential to the exercise. using geochemical data in Earth systems. synthesizing, presenting and discussing information about petrologic processes associated with active volcanism at Kīlauea Volcano. 3. collaborating on a particular phase of the eruption in preparation for group oral presentation and discussion. 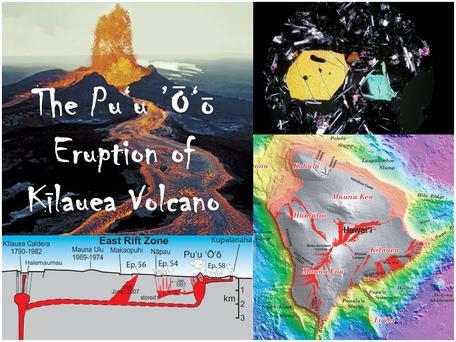 Pre-lab material provides background on the Hawaiian hotspot and the current eruption utilizing maps, diagrams, information, photographs, and video footage of the Pu'u 'Ō'ō eruption with written questions that test understanding of this material. Examination of hand samples (available on request) and photomicrographs of lavas from a distinct interval of the Pu'u 'Ō'ō eruption with group partners in lab. Working within groups assigned to particular intervals of the eruption to make time-series analyses of lava geochemistry from the Pu'u 'Ō'ō eruption to evaluate crustal processes of magmatic evolution. Interpretation and synthesis of background information, petrography, and geochemistry, and presentation of results and interpretation with group partners at the beginning of the next lab period. The lab simulates scientific research in volcanology, geochemistry, and petrology. The pre-lab material with homework questions encourages students to start the lab with background knowledge of Hawaiian hotspot volcanism and the Pu'u 'Ō'ō eruption. The collaborative investigation of a particular phase of the eruption using petrography and geochemistry parallels ongoing research projects on active volcanoes and is evaluated by answering questions. The primary goal of the lab is the synthesis and presentation of results and hypotheses by each group, which are then evaluated in group discussion. A list of selected references for the lab is included with the supporting materials.